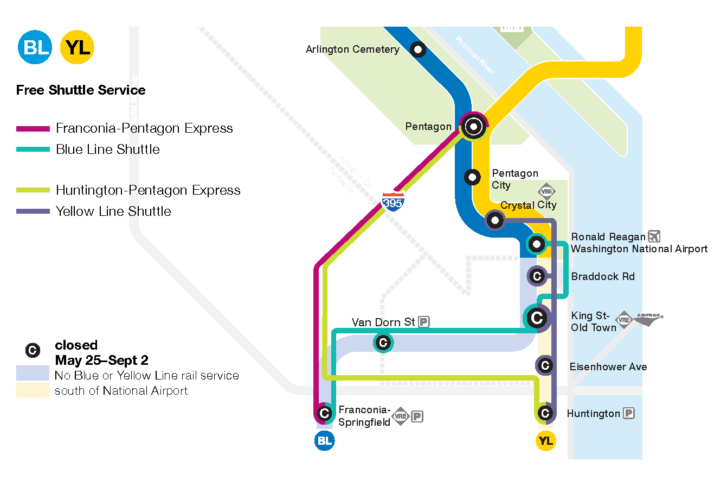 Alexandria's final draft mitigation plan for the monthslong closure of all Blue and Yellow Line stations south of Reagan National Airport has been published. Here's what you need to know. Editor’s note, March 7: Alexandria revised its plans Thursday, and no longer plans to make all DASH bus service free, but is considering other additional transportation changes. In Virginia, Alexandria’s DASH Bus will be free this summer, water taxi rides across the Potomac River could have discounted rates and the King Street Trolley is set to start running earlier each day, as part of efforts to deal with a major Metro shutdown. Alexandria’s final draft mitigation plan for the monthslong closure of all Blue and Yellow Line stations south of Reagan National Airport was published Tuesday. The city is accepting any final comments now on ideas to tweak its final draft, which builds on an outline presented to the City Council in January. Franconia-Springfield, Van Dorn Street, Eisenhower Avenue, Huntington, King Street-Old Town and Braddock Road stations will be closed from May 25 through Sept. 2, for platform repairs and other track work. That’s Memorial Day weekend through Labor Day weekend. While Virginia Railway Express will be a weekday rush hour option between Union Station, L’Enfant Plaza, King Street/Alexandria, and Franconia-Springfield, other stations will be served only by shuttle buses. Alexandria’s draft plan also shows Metro plans to add midday 11Y bus service in both directions weekdays between Mt. Vernon, the National Mall and Foggy Bottom, as part of additional service on a number of regular bus routes (8Z, 10A, 10E, 21A). The city also plans to make DASH bus trips free during the shutdown and to add service on the AT3 and AT4 routes between Hunting Point and Old Town, Parkfairfax and Pentagon. The DASH King Street Trolley between the waterfront and shuttle buses at King Street-Old Town is scheduled to start running much earlier than usual — at 7 a.m. weekdays and 9 a.m. weekends. It will provide a connection to expanded water taxi service. The city also plans to contribute toward rides on Potomac Riverboat Company water taxis, which could add up to two new morning roundtrips between The Wharf in D.C. and the Alexandria waterfront if demand warrants. Alexandria is still analyzing potential increases to HOV requirements through the city, improved traffic control and coordination with Virginia Department of Transportation bus lane plans. The state is also considering bus lane and related changes. The city plans to encourage slugging, carpooling and vanpooling, particularly from Landmark Mall, and to focus on improving sidewalks and bus stops in the hopes of limiting traffic jams. Dockless bikes and scooters, allowed in the city under a pilot program, and bike classes from the Washington Area Bicyclists Association are also part of Alexandria’s plan. Total costs for Alexandria’s plan could be as high as $2.1 million, although the city expects the state to reimburse a significant part of those costs to reduce totals to as little as $521,000 if all requests are approved. Those costs do not include city oversight, outreach and communications costs. Braddock Road, King Street-Old Town, Eisenhower Avenue and Van Dorn Street are Alexandria stations. Franconia-Springfield and Huntington are in Fairfax County. Fairfax County is encouraging use of existing bus and VRE options, telework or alternative work schedules, carpooling, biking and walking. PRTC OmniRide is also looking into expanding service for Prince William County commuters. Next year, Metro plans similar station shutdowns for platform work are planned on the Green and Orange Lines.